A secret document that is being transported from England to the US by an English agent is intercepted and Holmes and Watson join in the chase to find the document before it falls into the wrong hands. Watson reads a book on American mannerisms on the flight over and is soon using slang, chewing gum and drinking milk shakes. Following a matchbook that has Holmes has figured out has the microfilm in it, Holmes travels around antique shops in Washington, DC, looking for clues. When he finally finds the bad guys he is saved by Watson who comes crashing through the doors with the police. Watson actually shoots and kills one of them. 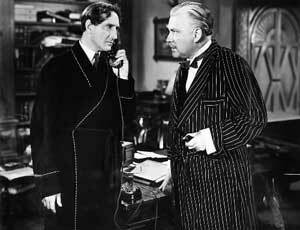 Sherlock Holmes: This is a great country, Watson. Dr. John H. Watson: It certainly is, my dear fellow. Sherlock Holmes: Look. Up there ahead. The Capitol - the very heart of this democracy. Dr. John H. Watson: Democracy - the only hope for the future, eh, Holmes? Sherlock Holmes: It is not given for us to peer into the mysteries of the future. But in the days to come, the British and American people for their own safety and the good of all will walk together in majesty and in justice and in peace. Dr. John H. Watson: That's magnificent. I quite agree with you. Sherlock Holmes: Not with me. With Mr. Winston Churchill. I was quoting from the speech he made not long ago in that very building.